Normally, I find myself writing up about things that I have already done, so I've decided it's about time I write about things that are going to happen (as well as what I've been up to so far). It is sometimes difficult to keep yourself motivated, especially if you run a business by yourself, and I found it very difficult during Christmas to get on with it and plan. However, I decided to take a risk and advertise the Beginners Crash Course again for the New Year, and included a possible afternoon class at the same time. Surprisingly, I had more interest in the afternoon class and so for a while at least I gained some new students. Some of them have joined me in their second crash course, but the afternoon class sadly fell by the wayside. I am now on my second Crash Course of the year. Early February I was to get my first hen party booking. I was told was that the hen liked anything disney, and they wanted me for an hour. 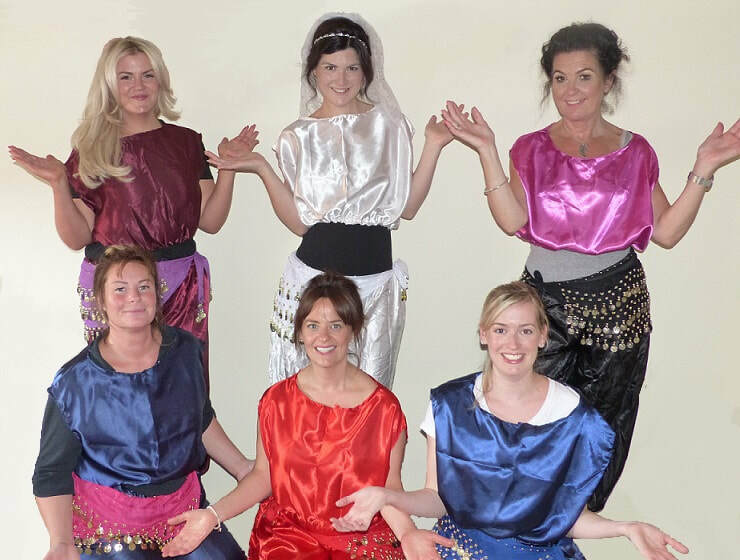 For a while now I have been toying with the idea of providing hen parties with fancy dress, and so I came up with the idea of the theme of Aladdin for this party, providing harem pants and tops, and using "A Whole New World" from Disney's film Aladdin. The girls thought it was a great idea and it proved to be a hit! So the costumes aren't brilliant as I made them myself and I'm not a seamstress, but it was agreed by all that they added to the fun. Late February saw my first Women's Institute for a while, this one with the Stalmine group near Fleetwood. It was lovely to go back to something that is so popular, and Stalmine were a lovely group who made me feel very welcome. Early March and I had my second Women's Institute, this time with the Lytham Belles. Again, a thoroughly enjoyable night with a lovely bunch of women. On the 10th March (a very busy day as it turns out) I was invited to perform at a charity event on behalf of Galloway's for the Blind in Penwortham. So I, and two friends/students went to dance for them in a half hour set. Sadly, we ended up indoors as the weather wasn't playing nice, but between us we danced six pieces which went down very well. It turns out that this fundraising event managed to raise just over £1500 which is brilliant since it was their first major event. Later, in the evening, I held my Springlicious hafla in Burscough where we managed to raise £146 for Just Because, my main charity. On the 19th March, I held a Groove taster session with Anne Kingston, my mentor. I arranged this to a) give students something new to try and b) allow Anne to teach another class to help towards her training. Sadly, we didn't have enough people in the end to help with this, but it was great fun and I would highly recommend it. I am hoping to arrange another one soon. On the 20th April I am looking forward to be performing at The Sparling in Garstang for a charity event on behalf of Cancer Help. On the 5th May I spent a lovely afternoon up in Windermere for my second hen party of the year. After getting dressed up I took the group into the gardens for a photo shoot. The hen (Deb) had a great time playing with the Isis Wings. After the photo shoot we all went indoors (sadly) and I taught a simple but fun choreography to Sia's "Cheap Thrills" as chosen by the organizer. It was great fun and we all had a great time. On the 12th and 13th May I spent a weekend with some of my dance friends where we worked on performance skills with Sara Farouk Ahmed. She had travelled from Egypt in order to teach us and it was wonderful to be able to work together. Then, on the 16th May, I travelled to Burnley to join a new Women's Institute there to present my talk. It was a bit of a surprise to see their meetings were on the top floor of a working men's club, but what a lovely bunch of women! I am looking forward to the end of the month as I have a 60th birthday celebration to attend and perform at in Southport. There is going to be a mix of entertainment throughout the night, including moi! In June I am hoping to be dancing in the Penwortham Gala again on the 9th June, providing the weather is kind to us! We have just started learning a choreography for this with Isis Wings which will be fun, and should look really spectacular. 03/06/2018 - Congratulations to Abigail (pictured above left) who gave birth to a beautiful little girl at 4.20am today, weighing 9lb 3oz. She's gorgeous!! 08/06/2018 - Well, it's the day before the big day. Penwortham Gala is tomorrow!!! Feeling nervous and excited all at once. Fingers crossed the weather will hold as I don't want to miss another year (we missed last year as it was throwing it down even more than the year before (see picture)!! Come along and support us as we dance our way around Penwortham in the procession (starts 12.30pm). Well, we've done it. Penwortham Gala is over for another year - and it stayed dry! We were back to our usual position within the parade, near the front. But it felt fast this year. The float in front of us left us for a while, although we did catch up once they reached the tricky turns. Once again I had the support of friends to carry my banner for us. Dance wise. Well, we did the best we could despite the speed (which Paul insisted he'd kept at 3 mph, which was slower than the floats in front), but it felt fast. All in all, a good day out. .23rd June - I have just gotten back from a last minute hen party. What fun we had! It might have been a small one, but it was still good. Louisa is getting married on July 9th and I really hope they have a lovely day. 13th July - Enjoyed a lovely evening last night with the Bromley Cross ladies of the W.I. 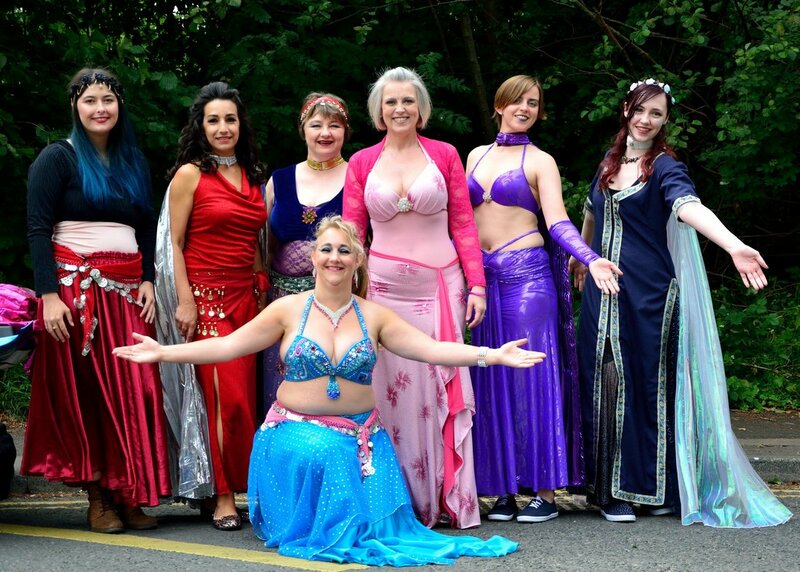 I presented my talk, Belly Dance; Styles and costuming. It was great fun with a wonderful atmosphere. Hopefully, there may be photographs to follow :-). By the time I arrived back home I had I received a lovely email with the following message: Many thanks for a super evening. Our ladies thoroughly enjoyed it. During the summer I am looking forward to teaching my summer workshops. I'm hoping to have some fun in the sun by teaching subjects that maybe we don't always have much for during the term time, and also things that might not be so scary to new people. At the beginning of August I had a last minute booking for a wedding! It was my first one and I was very nervous. I was worried that my choice of music may not be right, and that they may not like me, but it was actually good fun. On 27th October I will be holding my annual Spookilicious Hafla. It's always great fun as guests can let their hair down and so something different, something Halloween related. In November I will be travelling up to Sunderland to do a week-long Personal Development for Performance course with Kay Taylor and Sara Farouk Ahmed. I recently just booked my hotel, a lovely family run B&B where I stayed last year. I'm hoping we have dry weather as I have quite a bit of walking to do! 13th Dec - I've just realised that I haven't updated this page since September! So Spookilicious was a great night with lovely friends, a diverse range of performances, and a fang-tastic atmosphere, and we managed to raise £128 for charity! I have plans already in place for next year, much to the annoyance of my husband who feels he never gets a break from it all, but IF it comes off it'll be fabulous! The Development week in Sunderland was very good and I'm glad that I went. As with many of these things I am very excited about them when I first hear about them, but as they get closer I get more anxious and nervous. Mainly because I feel guilty for not being home. But I do need these projects to keep me interested and pushing myself so they are always good for me. It was just nice to be able to meet up with friends not seen for ages and to meet new people too. Well, I am currently winding down for Christmas. I am exhausted due to dance, kids and family, and ready for a break, but of course there are always lesson plans to prepare as well as advertising, events and other things to consider.